K'Vonnta is a very bold, daring, and loves having fun. He likes playing video games, football, basketball, and soccer. 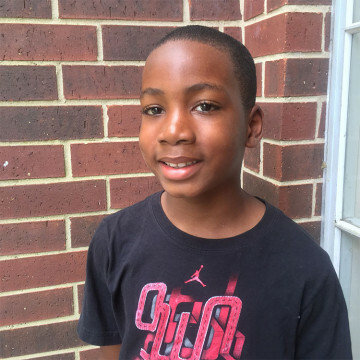 K'Vonnta enjoys attending children's church and having a good time with family and friends. He does have difficulty managing his behavior and controlling his attitude at times. K'Vonnta does best with one on one attention from his caregivers. He can be shy and very soft spoken at first meeting but warms up very quickly. K'Vonnta is very active and likes being involved in more than one activity at a time. Like other children his age, K'Vonnta does get upset when things do not go as he would like. K'Vonnta is working on ways to manage his behavior and learning how to take responsibility for his actions and mistakes. Jeremiah and K'Vonnta are very attached to each other. The siblings display typical sibling behaviors such as bickering back and forth. Jeremiah, as the older, tends to take the leader role in their relationship. K'Vonnta actually looks up to his older brother, Jeremiah. They both likes playing football and video games. The two brothers show their affection by giving each other hugs. They enjoy playing together with board games, watch TV together, and playing video games. They love going on family outings and meeting new people. Jeremiah is upbeat and usually happy. K'Vonnta is shy and very soft spoken upon first meeting. The boys look forward to finding the family who will adopt them both, as they very much want to stay together. K'Vonnta will benefit from a two parent family. He needs a family who will provide him with a lot of time and attention. K'Vonnta will do best in a family with no more than two or three other children in the home.